Becky, Boris and the Beats is the Beanstalk Arts house band! We play regular daytime family friendly gigs, and after a successful Kickstarter campaign, have released one album ‘Story Songs’ and we’re in the process of recording the next! Our current album is available on CD and digital download, and features 9 original songs from Becky. Boris and the Beats! 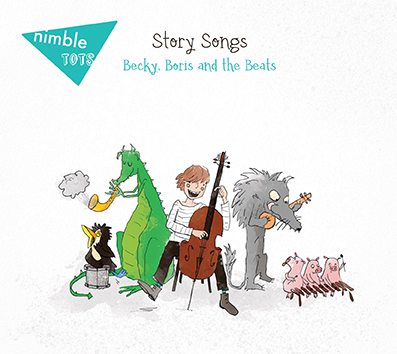 It includes songs about Boris the Bird, reluctant dragons, spiders, the Big Bad Wolf himself and Cinderella’s missing shoe. Listen or buy the album here!